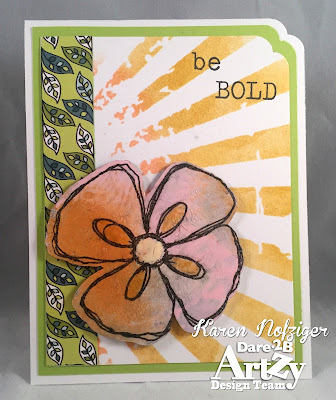 It's my day over at Dare 2B Artzy, and today, I'm sharing a card that stretched my creative boundaries a bit using Totally Tracy Chipboard and the Be Bold Stamps. For the background, I used a TH stencil with distress ink in Fossilized Amber and Dried Marigold. For the flower, I used TH distress paints in Spun Sugar and Dried Marigold. 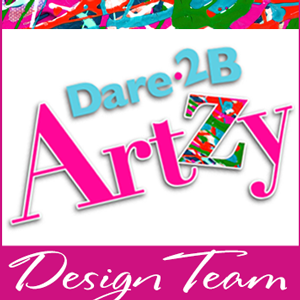 The Dare 2B Artzy Totally Black ink stamped that dark pretty flower image, and the center is Nuvo Drops. I painted the whole flower with crackle paint. Wonderful card! Great use of the TH line of products!